Darius N. Couch (1822-97), Major General, USA (NY). Antietam, Fredericksburg, Chancellorsville, Gettysburg, Wilderness, Nashville. 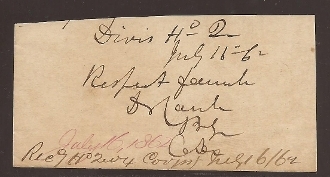 Clip Autograph Endorsement Signed (AES), Division Head Quarters, July 16th, 1862 with rank as Brigadier General.